PERFECTLY CRISP AIR touches every corner of the forest. A cobalt sky cradles the sun, and a few wispy clouds float by overhead. Flags flutter at half-staff; it is September 11, and to commemorate the solemn occasion, four military veterans accompanied by family and friends gather at the base of New Hampshire’s Mount Washington. “Rather than allowing 9/11 to continue to live in infamy and sadness, we want to use the day as a point of strength, unification, and renewal,” says Nick Watson, a 39-year-old former sergeant in the Army Rangers and a founder of Veterans Expeditions (VetEx), a Colorado-based nonprofit that has organized 15 wilderness challenges. Since its inception in 2010, VetEx has mustered 220 veterans across the country for its trips. (This climb was organized jointly by VetEx and the American Alpine Club.) “Veterans feel different when they come home, and they should. War changes people,” says Watson, who is from West Newbury and climbed frequently in the Whites as a kid. The 4-plus-mile Tuckerman Ravine route gains approximately 4,250 feet in altitude. Our group begins in silence, but conversation slowly percolates as we walk through a dense forest of oaks, maples, ash, and birch. Thomas Jude Carroll, a 46-year-old Army veteran who lives in Colorado, lost his left leg in a motorcycle accident and is wearing a prosthesis. He talks a little about why he is here: “I do it for those who can’t be with us, but also for those still here, especially guys coming home. By tackling a mountain or some other tough goal, they can learn how to be proud of themselves again, and this will help them get back into society. It may seem like climbing is just climbing, but the impact is really awesome.” Steve Arsenault, an Army veteran from Bedford who earned two Purple Hearts in Vietnam, is here, too. A legend in the climbing world, known for putting up first ascents throughout the Northeast and for being the first New Englander to climb El Capitan in Yosemite, he feels inspired by the company. “Whenever I start feeling sorry for myself, I’ll think of Tommy [Carroll],” says Arsenault, who is 66. After hiking for five hours, we find ourselves just shy of the highest spot in the Northeast. 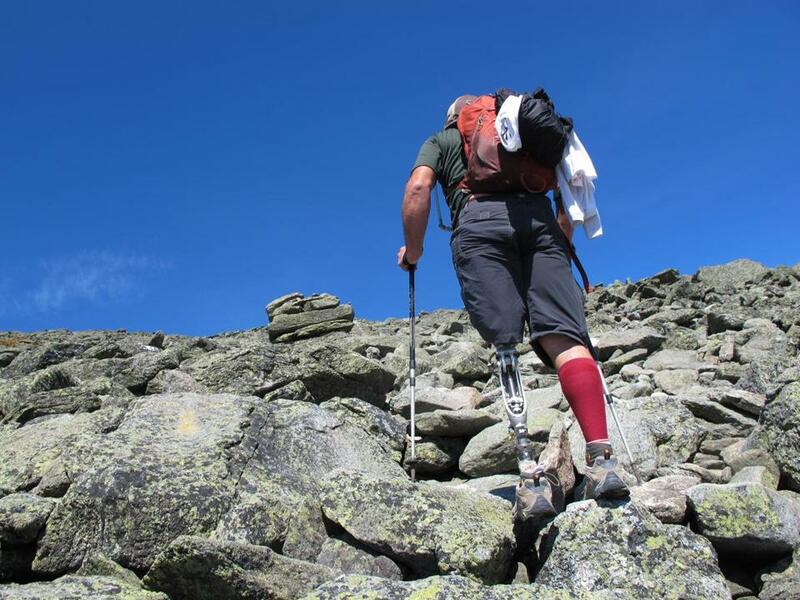 David J. Westley, 39 and an Army veteran from Burlington, Vermont, is commemorating 9/11 by traversing seven peaks of the Presidential Range this day. He hollers from above and makes his way toward us. Westley, who has already topped out on four peaks prior to meeting us, timed his summit of 6,288-foot Mount Washington to correspond with ours.